U.S. Naval Captain and Cryptanalyst Joseph Rochefort, who handpicked the men that formed Project Hypo. Public domain photograph from the U.S. Naval Historical Center, courtesy of Wikimedia Commons. Elvin Urquhart was a code breaker who helped the United States Navy break the Japanese Navy General Operational Code, or JN25, during World War II. 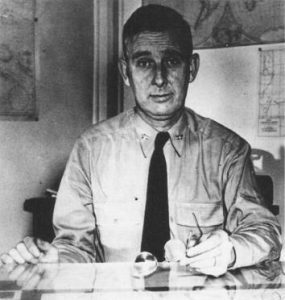 Captain Joseph Rochefort handpicked Urquhart to be part of Station Hypo, a code breaking unit of the U.S. Office of Naval Intelligence based in Pearl Harbor. In an interview with the Mesa County Oral History Project, Urquhart talks about how Station Hypo broke the code and helped turn the tide of the war for the United States. After the surprise attack on Pearl Harbor and the Battle of the Coral Sea (May 1942), the United States Navy was left with a decimated force. At the Battle of Midway (June 1942), the Japanese committed a large force, hoping to overwhelm the smaller American fleet. The Americans, however, aided by Urquhart’s intelligence division, were able to turn the tables on the Japanese. According to Urquhart, the Japanese used a system of syllabic writing called Kana in their code. Because the Japanese script could not be transmitted over the wire, the Japanese used the Latin alphabet instead, paring letters to transliterate the Japanese language. The American code breakers were able to figure out the Japanese code for “ship”. Then, by comparing the huge volume of intercepted communications, the code breakers gradually came to understand the secrets underlying JN25. They broke the code. The Japanese Navy planned to ambush the Americans in the Battle of Midway, but because American cryptographers were able to determine the logistics of the planned attack, the Americans could plan an effective ambush of their own. As a result, the outnumbered American Navy defeated the Japanese and helped the Americans gain advantage in World War II.